All wreaths are custom designed. I will decorate the size you need (if available) in whatever colors you choose. Prices are based on the size, design and amount of flowers/decorations used to complete the look you want. Tell me your ideas in the extra box on the order form. I will be in touch with you via e-mail to work out all the details. Other sizes available other than shown here. Please e-mail me for details. Please visit our new home for WREATHS. 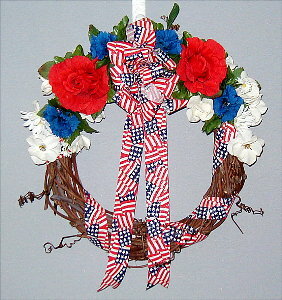 This 12" round grapevine wreath is all dressed up in Patriotic colors. Tell me what colors you would like and I will get back to you about the details. This oval wreath measures 14" long by 10" wide. 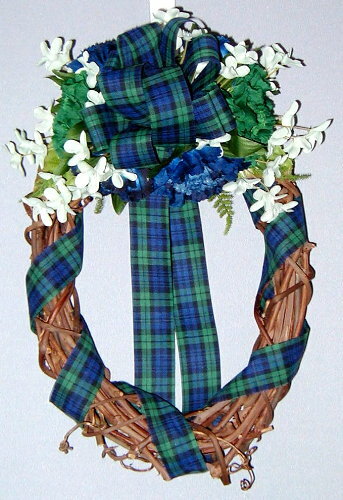 Shown here decorated with green and navy plaid ribbon wraps and bow. Hunter green and navy flowers accented with seafoam green flowers. I made this wreath for a customer. It is 16"-18" in diameter. It is decorated with hunter, Burgundy and antique gold flowers with sprigs of eucalyptus adding character. Sheer Burgundy ribbon wraps around the wreath. 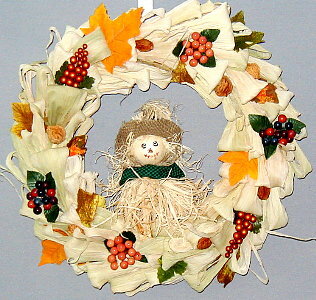 A 14" straw wreath base covered with cornhusks. 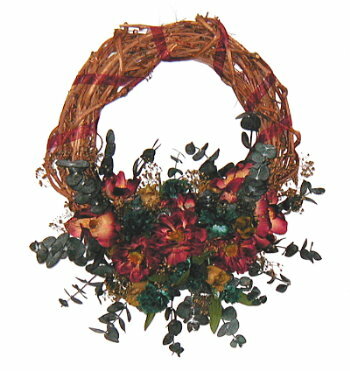 Nuts, berries and fall leaves are inserted around the wreath. A perky little scarecrow accentuates the center.